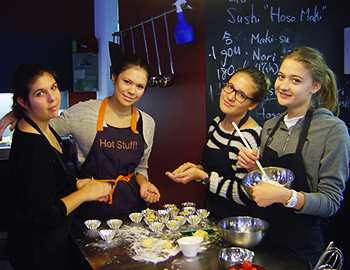 Switzerland’s best boarding schools are all unique, each possessing a blend different ‘ingredients’. Here’s the winning recipe behind Brillantmont that places it among the country’s, and indeed the world’s, top centres of learning. Take a stunningly beautiful location and place there a campus with eight buildings both modern and historic, all overlooking picturesque Lake Geneva (Lac Leman). Add 60 day students and 100 boarding students from 40 different countries. Be careful not to exceed more than 15 students per class, to ensure that each child receives the perfect amount of attention from their teachers. Divide your students up into seven grades, with English as the primary language and French compulsory in Middle School (11-14 years) and encouraged in High School (14-18 years). Allow students to participate in world class academic programmes and respected curricula. Place everything within a busy academic year that includes classes, educational trips, excursions, regular parent-teacher meetings, public holidays and breaks, school arrivals and end-of-year graduations. No school recipe would be complete without a truly dedicated team of teachers, staff and directors. Just like at Brillantmont, they should be committed to high standards of education and the welfare and development of every child in their care. Finally, garnish your school with the educational expertise that comes from 132 years of teaching heritage. This final ingredient is very rare, but can be found in abundance here at Brillantmont International School, Lausanne. If you’d like to find out more about Switzerland and the reasons why it’s an amazing place for children to learn, download our new ebook called Why Study in Switzerland? In it you’ll find lots of interesting information about Swiss culture, traditions and its academic landscape, as well as touching stories and testimonials from students, alumni and parents.